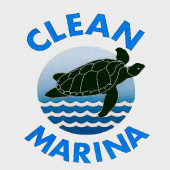 From Wilmington Marine Center you can easily access our area beaches and Cape Fear River to explore the many landscapes of Wilmington whether you go by boat or car. You will find a diverse mix of history, restaurants, shopping and a growing brewery industry. 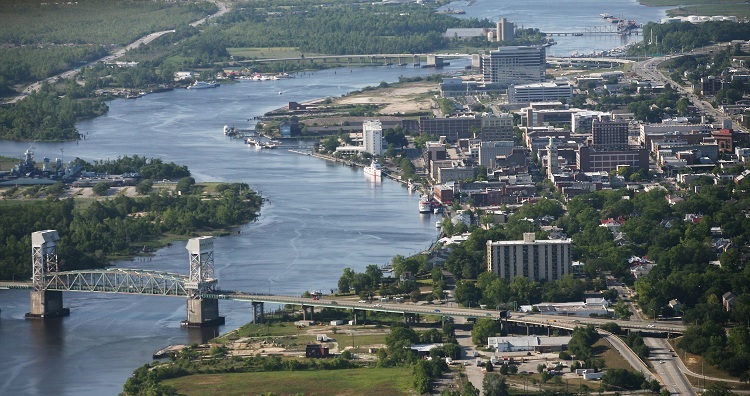 Wilmington was settled by European Americans along the Cape Fear River. Its historic downtown has a Riverwalk that extends from bridge to bridge originally developed as a tourist attraction, and in 2014 Wilmington’s riverfront was named the “Best American Riverfront” by USA Today. 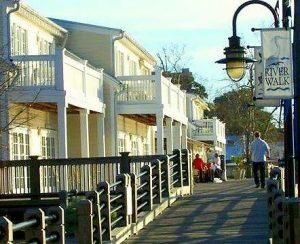 Along the Riverwalk you will find, waterfront dining, quaint shops, the USCG Diligence and the Wilmington Convention Center. Look across the river to the natural area of Eagles Island and the historic and renowned USS North Carolina Battleship. The National Trust for Historic Preservation named Wilmington, North Carolina, as one of its 2008 Dozen Distinctive Destinations. Many walking and horse drawn tours are offered daily to explore the locally owned shops and restaurants, and historic homes surrounding the downtown. Or hop on one of the Port City Bike taxis or free Trolley to take you from the growing north Riverfront District location of The Wilmington Convention Center, to the Castle Street Arts and Antiques and Brooklyn Arts Districts. Carolina Beach offers an original kind of beach experience from the past with old-time beach charm combined with a fun, family-friendly spin for today. Visitors can experience a vintage, nationally-recognized seaside boardwalk, live music, miles of beautiful beach, world-class fishing, one-of-a kind festival and events, and all kinds of people united by good times that are unmistakably Carolina Beach. Kure (pronounced CURE-ee) Beach was once covered by a maritime forest that held the land in place during storms. The town is still bordered on its west side by this forest that runs along the Cape Fear River. Kure Beach was incorporated in 1947 and has grown into a mainly residential community that has attracted people to move here from all over. Visitors are attracted here as well by the town’s quaint, family atmosphere, its proximity to historic sites, its beautiful vistas of the river and ocean and the unique “Mom and Pop” hotels, shops and restaurants in its business district. 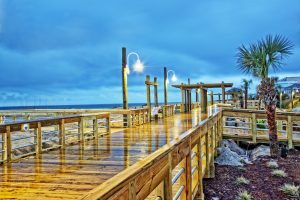 The Kure Beach Fishing Pier, the first pier to be built along the Atlantic Coast and the oldest fishing pier on the East Coast, is still enticing fishermen from all over the United States. Ft. Fisher Site of the Civil War’s largest amphibious battle, the remaining portion of the gigantic Fort Fisher earthworks, along with a restored palisade fence and impressive seacoast gun, sits near the Visitors Center. The fully accessible visitors center & gift shop includes a video, exhibits, and artifacts recovered from sunken ships. The scenic trail, shaded by gnarled live oaks, leads past the earthworks, around to the rear of the fort remains. Guided tours and wayside exhibits provide historical orientation. Other exhibits include items recovered from sunken blockade runners. From active lifestyles with plenty of watersports and outdoor activities, to vibrant and friendly community gatherings, there’s never a shortage of something happening year-round in Wrightsville Beach. Known for its crystal blue waters and spacious beach, surfing and standup paddleboard competitions, and signature kids’ programs it’s easy to find something to do here.